Renewing a passport photo, heading to a photo shoot, or planning a romantic date? Watch as lovely Hayley Thompson transforms from make-up free-and-beautiful to flawlessly polished. This dazzling, easy to achieve look works as an everyday routine that takes five minutes, or can be tweaked for a special occasion. 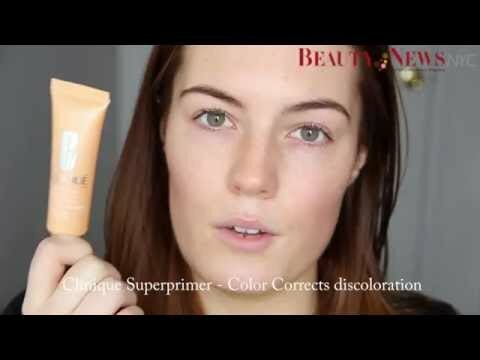 Follow along with Hayley’s simple steps as she starts with a moisturizing primer (Clinique Superprimer – Colour Corrects Discolourations or Smashbox Photo Finish Hydrating Primer), then evens the skin tone with Nars Sheer Matte Foundation and GoLumene CC color correcting cream with SPF. To cover imperfections she demonstrates how to use Laura Mercier Silk Creme Foundation, and adds tips for tweaking for evening use, blending with Bdellium Tools, Green Bambu 957. Banish dark circles artfully as shown with Clinique Airbrush Concealer. Hayley includes tricks and tips for the eye area and to avoid creasing. Then comes quick pinpoint concealing with two shades, using Laura Mercier Secret Camouflage Concealer SC-1 and Laura Mercier Secret Camouflage Brush. Goodbye redness. Goodbye pimples. Blush tricks follow, using Blush Make Up For Ever HD Blush, and then to set everything in place, Hayley shows you how to top it off with Laura Mercier Loose Setting Powder using a Laura Mercier Fan Powder Brush. You’ll want to add just a touch of sculpting color with matte bronze everyday sculpting Make Up For Ever Mat Bronzer and the Sigma F25 Tapered Face brush. For highlights: Smashbox Softlights Highlighter Shimmer, demonstrated with a subtle application.